Over the past couple of days, various festivities in honour of the Virgen del Carmen, the patron saint of fishermen and sailors, have been in full swing. Around 16th July each year, many of the coastal towns and fishing villages of Spain celebrate by parading the statue of Virgin del Carmen through the streets, accompanied by the steady rhythm of a brass band, the resounding thump of a drumbeat and the cries from the crowd of “guappa” or “viva” as the statue passes by. 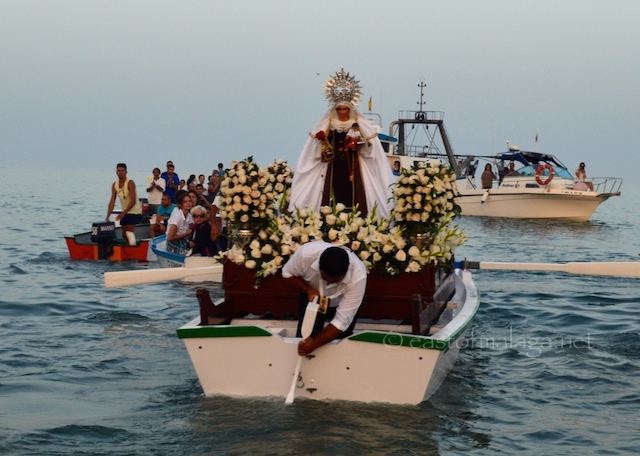 At dusk, after the procession arrives at the water’s edge, the Virgin del Carmen is taken out to sea on a flower-decked boat, accompanied by a flotilla of fishing boats (jábegas),to bless their fishing grounds. The Virgen del Carmen is of great importance to the inhabitants of Axarquían towns and villages such as Caleta de Vélez, Nerja, Rincón de la Victoría and Torre del Mar because many larger towns and holiday resorts along the coast were once small fishing villages where the sea provided their daily existence. But we need to look back to the scriptures of the Old Testament, centuries before the birth of Christ, for the origin of the Virgen del Carmen. The Bible tells us that the prophet Elijah went up Mount Carmelo near Haife, in Israel to pray for rain to relieve a great drought that had parched the lands. Whilst Elijah was on Mount Carmelo, he saw white clouds forming, which would bring the much needed rain. Elijah interpreted the clouds as a sign of the coming of a Saviour who would be born of a Virgin. In gratitude for the rain, the community dedicated itself to praying for the mother of the Saviour to come, and the Order of the Carmelites was formed. On 16th July 1251, the Virgen del Carmen is said to have appeared to Englishman, Simon Stock, who was responsible for building Carmelite monasteries throughout Europe in the 13th century. The story goes that when she appeared to him, the Virgen was holding a scapular and she promised that Carmelites who show their devotion should use this as a sign of privilege that they would be “granted the grace of final perseverance and be delivered from eternal Purgatory”. A scapular was originally an apron, forming part of the dress of a religious order, but for the lay-faithful, scapulars usually bear images, or verses from scripture. Devotional scapulars typically consist of two rectangular pieces of cloth, wool or other fabric that are connected by bands. One rectangle hangs over the chest of the wearer, while the other rests on the back, with the bands running over the shoulders. The Virgin Mary of Mount Carmelo (the Virgin of Carmen or Virgen del Carmen) is also known as Stella Maris (Latin for Star of the Sea) which is the name given to the Pole Star (Polaris) used by mariners for centuries as celestial navigation. Which is your favourite Spanish festival? This entry was tagged Andalucía, culture, customs, East of Malaga, Europe, fiestas, flowers, life, Malaga, Mount Carmelo, photography, Religion, Spain, travel, virgen del Carmen. Bookmark the permalink. An inspiring journey of faith and many more. It’s truly beautiful when a community brings faith and hope in their daily lives. To honor where our blessings comes from. Thanks for your comment – always very much appreciated. I can just picture you holding your dress in the waves and Michael shaking his head. What a pity he did not have a camera too so we could see for ourselves your valiant effort to get the good shot. Hahahaha ….he’s used to it by now, Jo! To be honest, there were so many people that he lost sight of me, but he knew that once I had got my shots I would turn up again where I left him. You ? Go for it ? That doesn’t surprise me one iota !!!! It is one of the things that makes you so much fun. Your determination and wet sun dress paid off. Great shots and description of this religious tradition, Marianne. I love that the festival and commemorations still have a place in Spanish culture 🙂 I admire your adventure and dedication in getting the pics. These festivals are not only traditional, but have a whiff of the “old-fashioned” about them. Another thing is that all the generations take part – there were lots of grandparents as well as children, on the beach that night. These festivals for the Virgen are always so joyous. I’ve attended many in Mexico. Your photos are such a wonderful series of this celebration! Thanks for your kind words – always much appreciated. So interesting. I loved the header. I do not have a favorite Spanish festival but I surely wish I did! I surely would, not a doubt in my mind. Your world seems so passionate! Great pics. 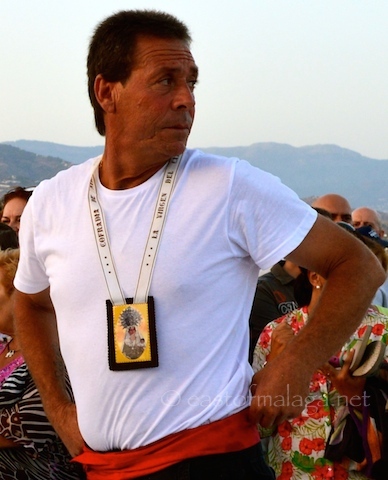 I saw two Carmen processions last year in Málaga… in Pedregalejo and Malagueta beach. Wonderful. Do they have any Carmen festivities in Seville, on the river? I’d love to see one of these festivals. so vibrant! I hope you can, too, Gilly – they are usually great fun, and everyone is so friendly. Thank you for sharing this wonderful, special parading the statue of Virgin del Carmen! Great photos. Thanks Amy – glad you enjoyed the photos. The soaking was worth it Marianne, at least from our point of view as you got some tremendous shots for us. There’s so much colour on these occasions. It reminds me of the old Whit Walks I used to see as a youngster that just seemed to fade away. Whatever happened to those Whit Walks, I wonder? I love seeing these festive events, whether they’ve a religious theme or not. It’s great to see the villagers come together for a traditional festival. I hope they never get too modern for them. Couldn’t agree more – you don’t have to be religious to see the passion and devotion in others. Things do get modernised, John – but because it’s “poco a poco” (little by little), then they are accepted. Another thing I love about these festivals, is that ALL the generations are there – just like they are in Italy, too. Beautiful photos! What a cool festival. Wasn’t it amazing? It’s always the same – so many people turn out for all the festivals. Hope you had as much fun as we did, Caroline!